Pooja Enterprises presents the finest Full Face Riding Helmet that are manufactured in-house using high quality materials. We use only the finest grade material to manufacture these helmets. We are reckoned as one of coveted manufacturers and suppliers of Two Wheeler Riding Helmets, which are acknowledged for their optimum reliability and longer functional life. 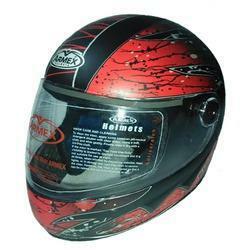 These Two Wheeler Riding Helmets are fabricated employing latest technology and are lauded for their easy maintenance and excellent performance. We offer a comprehensive range of head protection gears that are available in a wide array of option suiting different hazardous situation where head protection is a must. Some helmets have front shield, some have additional straps for extra protection and are at the same time lightweight for easy usage. Backed by a team of knowledgeable professionals, we are an identified firm in the market for providing an extensive range of Plain Horse Helmet. This Full-Face Motorcycle Rider Helmets (Suzlon) is perfect for people who prefer two wheelers. Customers can be eased with the affordable rates of the Full-Face Motorcycle Rider Helmets (Suzlon).